£9.99 is a Special Offer and one-off payment for the Tai Chi Healing Connections programme. You can view all the lessons whenever you like as a member of this package. Activate Your Health...Get Started Today. Tai Chi Healing Connections is a system of healing and personal development. Through the gentle flowing movements of 'The 5 Element Form' we discover that everything is connected. We can learn to transform our negative emotions into feelings of inner peace and joy! 10 minutes everyday provides us with our own personal space and treatment session with a gradual transformation into wellness and vitality. Tai Chi Healing Connections is Meditation in Movement. A 10 minute session will refresh your Body, Mind & Energy. Discover how Tai Chi Healing Connections can become your very own Healing Treatment Session. Learn how to identify imbalances in the body, mind and emotions. Use them as a Positive Guide to Transform & Lift your Mood, Energy and Life. Tai Chi Healing Connections is easy to learn and follow so you can get straight on with the relaxation and healing. As a Member of this programme you can login and watch the videos on any device or PC. Just connect to your wifi and go. As a member of this programme you can E-mail questions about your personal practise and development. "Since practising the Healing Connections programme I have found it very helpful and uplifting. I have various problems which stop me exercising vigorously and sometimes I can't do my full Tai Chi routine but this has proved to be very useful in both raising my energy and my willingness to do any exercise! I find the gentle movements & stillness is more beneficial than too much exertion. I have recently been diagnosed with fibromyalgia alongside other things and so fatigue is a constant battle as well as limited movement at times. However as inactivity can create more muscle problems and stiffness I have found this very helpful with motivation and wanted to share this with you!" 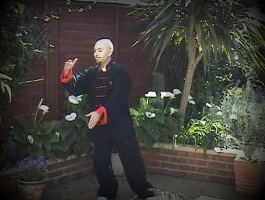 "Since practising Tai Chi Healing Connections I have no pain or stress in my feet. I suffer with Arthritis and I thought it was coincidence, but they feel better after EVERY lesson"
"It's a Fantastic Way to start my day...Feeling Great & In the Flow!" The programme includes everything you need to get you started. Including "The Tai Chi Warm Ups & "The 5 Element Forms". Each Element will be covered individually so you can enjoy and develop at an easy pace. The theory of Yin & Yang and the 5 Elements play a key part of Tai Chi Healing Connections. You can gradually apply these Healing principles to other areas of your life. It's So Easy to fit the programme as part of your daily routine. You will feel that "When your Chi is abundant and flowing you can feel happy, connected and healthy."